Big races: The biggest race of her career was last year's Breeders' Cup Juvenile Fillies. She made a joke of it, winning by nearly six lengths as the overwhelming favorite. It was a solid field, but they were no match for her - a story she has repeated time and again through her 11-race career. No matter how big the race is, the story is the same - she has never had a horse within three lengths of her at the finish line. Last race: Her last outing was in the Cotillion Stakes at Parx in Philadelphia in late September. It's a big-time race for three-year-old fillies - five of the last 12 winners before this year have also won Eclipse Awards. For Songbird, who already has one Eclipse Award of her own and is well on her way to another, this win was just as easy as all the rest. She stalked the pace from close by early on, made her move around the final turn, and pulled away down the stretch like she was the only one allowed to run. She won it by just under six lengths, and she didn't even begin to tap her reserves. She could have won it by 30 lengths if she had needed to. Effort: This will be the eighth race of the year for Songbird - a full schedule, but certainly not an unreasonable one. She has won each of the seven races and has never truly been tested. Sometimes a horse that has raced this much could be out of gas by this late portion of the season. It's hard to imagine that she's even a little tired given the season she has had and how easily she has won. She's going to be just fine. Distance: The Distaff is run at nine furlongs - a mile and an eighth. Three races back she ran at that distance for the first time. She won by more than five lengths. Next time out she ran an extra furlong further. She won by seven lengths. The distance is not a concern. Works: Since the Cotillion she has worked three times. All three have been on the same Santa Anita track as she will race on here. She has fired a bullet in each, meaning she was the fastest horse at that distance that morning. One bullet leading up to a race is a big deal. Three is just ridiculous. Have I mentioned that this is a really good horse? Older horses: If there is one reason for mild concern here it is that she has never previously faced older horses. She only faced two year olds last year, and only three year olds this year. Older horses are typically more experienced and stronger than younger ones, so she is likely facing the best horses she has ever seen. It's not just random older horses here, either. Beholder has won this race twice before, and despite three straight second-place finishes leading into this one she is among the best horses in the country. Curalina was third in this race last year at three and has two wins in for starts this year. Forever Unbridled has three wins in five starts this year. I'm a Chatterbox won the Cotillion last year and has three wins this year. Stellar Wind has two wins in three starts this year, and both are over Beholder. Last year she was second in this race by just a neck. It's a crazy good field, and a real test. Jockey: Mike Smith has been aboard this horse for every career race. 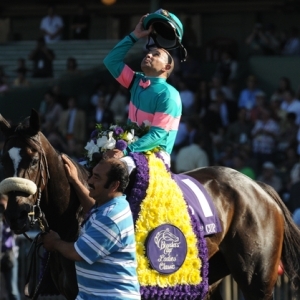 He has won 22 career Breeders' Cup races - more than any other rider in history. He's a master at riding fillies in big races - as good as any rider has ever been. He's long been based in Southern California, and he knows this track extremely well. Songbird is in the best hands she could be in for the situation. Trainer: Jerry Hollendorfer is 70 years old and has well over 7,000 career wins. He's a very good trainer. He hasn't always played at the highest levels of this sport - he is mostly based in Northern California - but with this horse coming right on the heels of Shared Belief he is on a hot streak with elite horses. He won his second Breeders' Cup race with this filly last year and has won Eclipse Awards with three horses, so he isn't a stranger to high-level racing. He obviously is dialed in with this horse. Again, she's in good hands. Race shape: In her last nine races she has never been worse than second at a single race call. She likes to be on or near the lead the whole way. That could be a slight challenge here, because a lot of these other fillies and mares like the same type of running style. Beholder often is right near the lead and has never been worse than second at any point in her last four races. Carina Mia set the pace for Songbird in the Cotillion and consistently sets the early pace. Curalina runs up front. So does I'm a Chatterbox. Stellar Wind stalks within striking distance of the lead, too. With this much speed in a race there could be a lot of pressure early on, and the pace could get out of control, burning out the speed and opening it up for more patient horses. In a case like this, though, when there is so much class amongst the speed, the winner might not be the fastest horse but instead the one that can best adapt their running style to the situation to create their opportunities. This is a very smart and well-handled horse, so I like her chances.